People who want to spend the weekend by having fun in the water with their friends or family, of course the tandem kayak should be the right choice for them. These kayaks actually have double seats and separate space on the deck for placing the feet properly. The tandem kayaks are not only great for having family fun, but also these kayaks can be used for fishing in the lake, river, stream and sometimes in the sea. 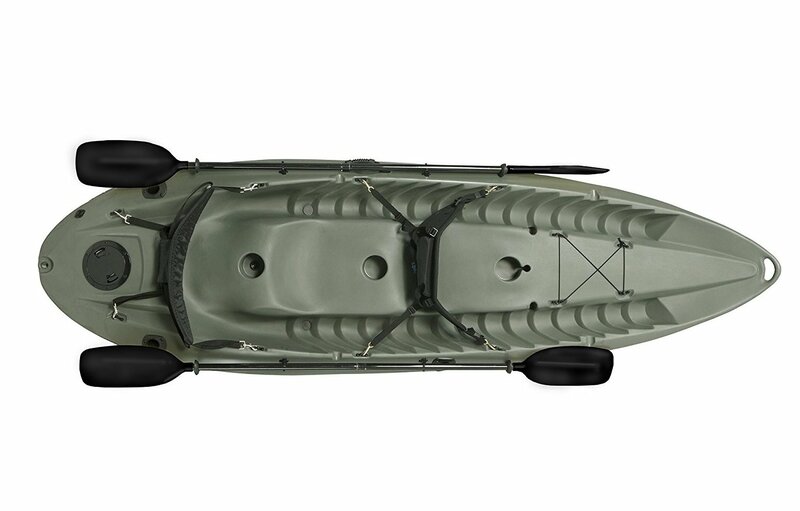 Like a conventional fishing kayak, the tandem kayaks also can have storage compartments and fishing rod holders. 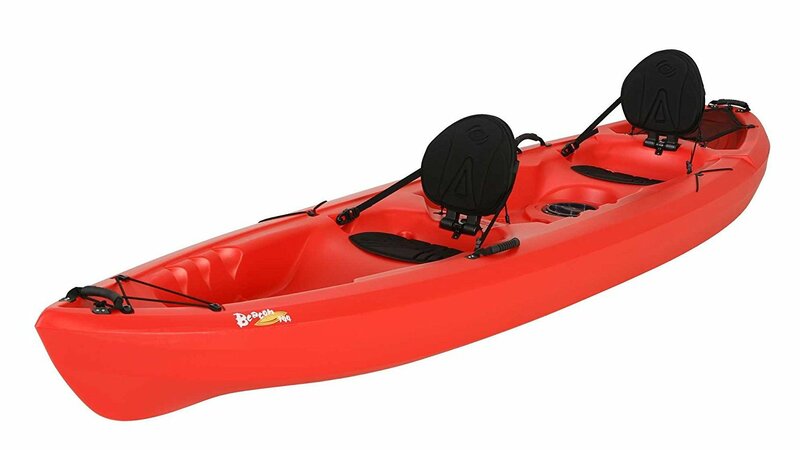 But in most cases, these kayaks are designed for having fun or touring in the lake or river. 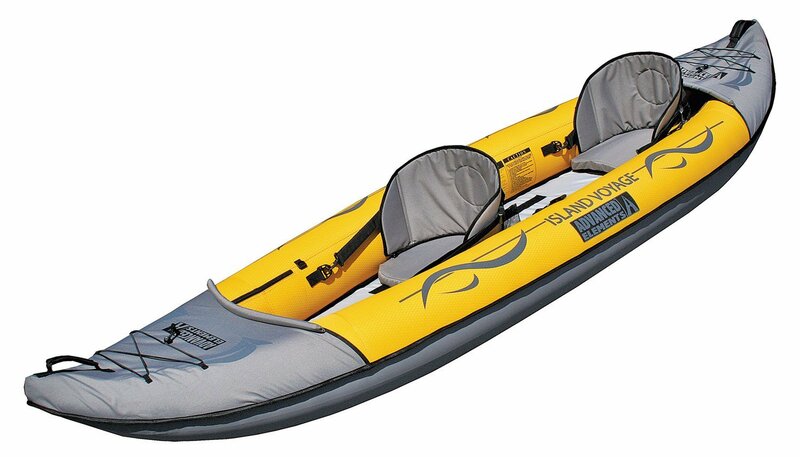 Like other conventional kayaks, the tandem kayaks can be inflatable or non-inflatable. So if you choose a non-inflatable kayaks, simply it can have polyethylene based sturdy hull. But if you choose an inflatable tandem kayak, then like the other conventional inflatable kayaks it needs inflation. So it totally depends on your preference of what kind of kayak you like. Here is also a video from an expert who explained well why you need a tandem kayak. Materials: Materials are everything that will ensure how sturdy the kayak is. Whether it is inflatable or non-inflatable, it does matter what kind of material the kayak used for the hull or body. The high density polyethylene can make a non inflatable kayak extremely stable & sturdy while the puncture resistant vinyl is good for inflatable kayaks. So before choosing a tandem kayak make sure it is made of this kind of materials. Several Air Chambers On Inflatable Kayaks: Most of the times the inflatable kayaks use multiple air chambers as if a simple leakage can’t sink the kayak in water. It means if a chamber is leaked, the other chamber will still support to float the kayak. This is one of the great feature that should have on an inflatable kayak. Inflatable or Tough Hull: The tough hull kayak means incredible stability and power of tolerating the roughness. The ocean kayaks that would be used to beat the force of waves, they always would choose the tough polyethylene for the hull instead being inflatable. Because an inflatable kayak would never be same like the double hull polyethylene kayak. Inflatable kayaks are unique in the matter of recreation on the lake, river and medium wavy water. So if you want adventurous recreation, better to pick a tough hull based kayak, but for the lightweight and medium use the inflatable kayaks are dependable. Storage Space: Whether you use a kayak for fishing or touring, the storage space can hold the personal items, foods and gears on the safest place. Mostly, the non-inflatable kayaks can have seal storage box for dry storage and open deck storage with bungee. But in most cases, the inflatable kayaks can have open deck storage with bungee where you can put the items. Fishing or Recreational: The fishing and recreational kayaks are almost similar and the types of hulls and stability are also same. The stability and capacity are also considered in the same way. But the fishing kayaks have rod holders and maximum storing option as the fisherman won’t only carry snacks and some foods, but also their lots of accessories. If you use it for touring or recreational, no problem is there. Although a recreational kayak isn’t expectedly good for fishing. But if it has great storing option and you add the rod holders manually, then no problem to go fishing with it. Paddle Cradles: The paddle cradles will help to keep the paddle in a safest place as if you don’t lose the paddles. It is the great place where you can safely put the kayak’s paddles. Here are the 10 best tandem kayaks that would be great for various kinds of activities in the water. Take some time, read the specifications and choose one by your preference. 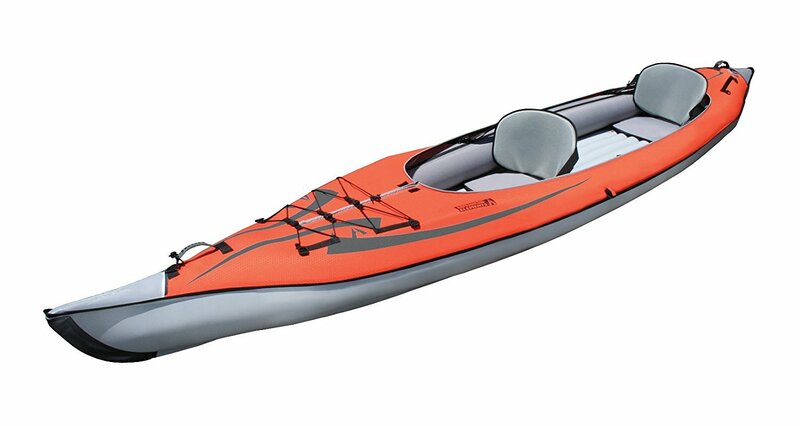 This 13.5 foot long kayak has some great features that can maximize the level of your enjoyment. Firstly the kayak can hold three persons at the same time as it has a comfy middle seat that is designed for holding an additional user. To ensure the comfortability for every user it has two comfy adjustable seats with a pure back support and for every single user it has a separate storage box with seal hatchback to safely hold your personal items. On the other hand, the molded cup holder can hold the cup of your drinks that you can have during the time you have fun. As well, comfortability is everything when you enjoy kayaking. If you can’t place the feet in right place, then your pedaling time would be very uncomfortable. That’s why it has adjustable foot braces that ensure you are going to place the feet in the most right position. Moreover, it is not god, if you unfortunately lose your pedal when you enjoy kayaking. That’s why it has paddle cradles to hold the pedals safely. 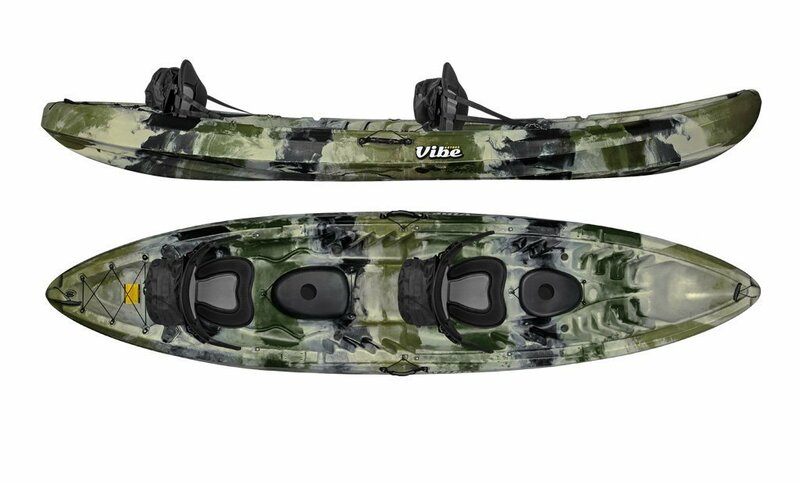 The Vibe Kayaks Skipjack 120T is a tandem fishing kayak that has extra features for holding fishing gears. But this versatile kayak can be used for your other simple holiday activities. This extremely stable 120T is designed with wider hull as it perfectly suits and performs in the surf or very rough water. 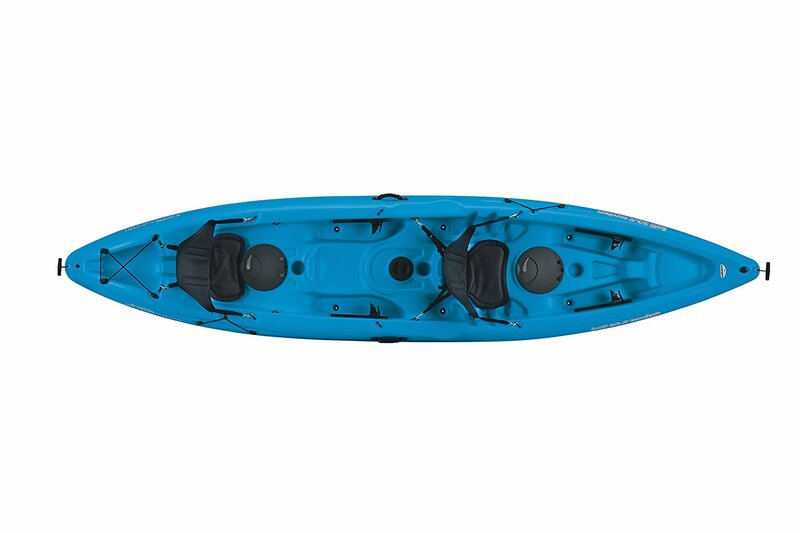 The kayak includes three seating positions with two comfy adjustable seats. So you can enjoy the kayaking with your kid for a perfect family time. Actually, whether you are an experienced or a beginner you can have the ability to easily maintain this kayak. 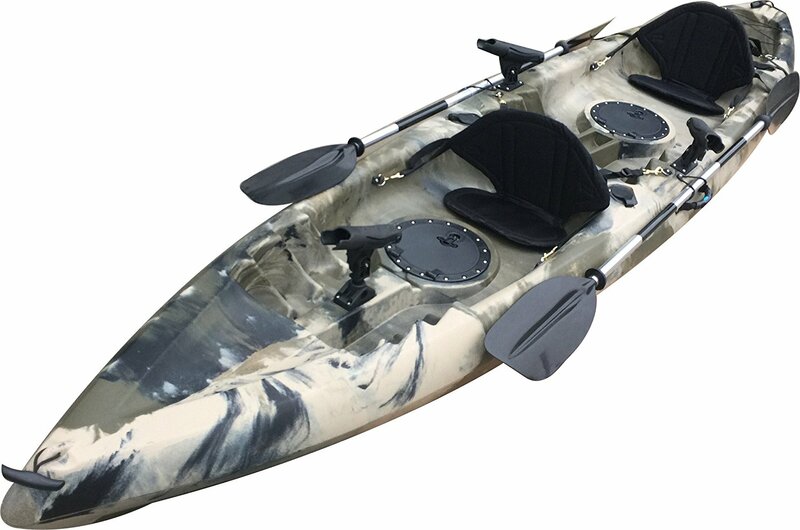 If you have this kayak on your fishing time, you can enjoy two flush mount rod holders of this kayak while the covered hatches will ensure your personal items, foods or accessories will be completely safe in the box. Moreover, it has 4 carrying handles, that can ensure getting your kayak on the edge of the water will be easy. On the other hand, it used uv resistant materials that will protect the kayak from damaging by sunrays. And when you are on the water with this kayak you shouldn’t be worried for puncturing. Because it has the floating ability even after getting a chamber leaked and if a chamber gets leaked by any incident, then the rest one will keep the kayak floated. This kayak can easily hold two people as the 350 pound weight limit is enough for holding two persons. 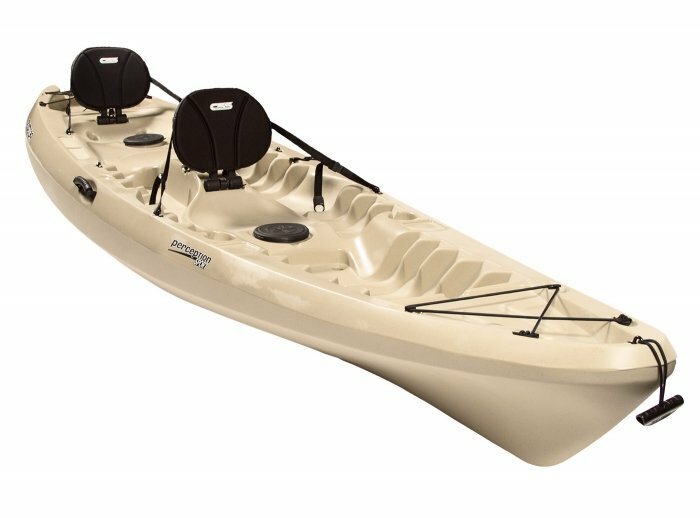 The Lifetime 10 Foot Tandem Kayak is a versatile, superior and greatly stable kayak for fishing or kayaking to have fun. This kayak can carry three people while the tunnel hull design of the kayak has been added to provide extreme stability. Whether you stand up or sit side its excellent stability will retain the great balance on any sitting position. This kayak has been composed of durable and lightweight polyethylene material for an easy transport and prevent the cracking. You can simply put the kayak on your minivan, truck or SUV for an easy transport. Moreover, it has three molded rod holders that can grab the fishing rods. On the other hand a dry storage box with seal hatch can hold some fishing related mini gears safely and if you want to put the pedals on a safer position, then the pedal cradles will help you to put the pedal securely. The kayak looks like a non-inflatable molded sturdy hull based kayak. But literally this is an inflatable kayak that has built in aluminum ribs to improve the tracking ability. The kayak is completely puncture resistant as it has three layers of material that extremely protect the kayak from puncture. The kayak is easily portable and you can anytime unfold it for an easy inflation. It features very comfortable high quality adjustable seats that you need to attach after inflation. 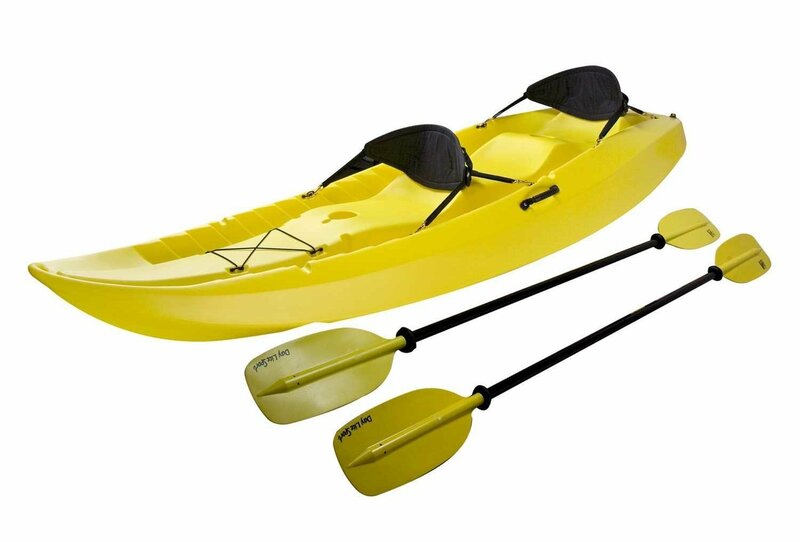 Moreover, the kayak has three seat locations that mean three people conveniently use the kayak at the same time. Amazingly, instead of having two or three chambers, it has six chambers that ultimately protect the kayak from the chances of puncturing. So you can apply it in any condition while the stability is very great. The adventurous mind anglers want the monster’s power on their kayak. Because the ocean is aggressive and it would test the stability of the kayak on high end way. So if you want an adventurous water excursion or fishing with a minimally stable kayak, you would reach at stake in the ocean. So before beating the monastery power of the waves and heavy wind, you should come to the shore with an efficient vessel that would overcome the ways with a fearless mind. This BKC UH- TK181 is that super kayak with 12 foot long hull and 450 lbs capacity. So just pick up your angler friend on it and get started on adventurous ocean fishing. The 7 rod holders would grab your rods on any angle and on every different space of the user it has separate molded foot braces that give the options to user for putting their feet on where they literally feel comfortable. The seats with positioning system also let you find the most preferable position for having a great backrest. Whether the kayak has been made for fishing or touring, stability is the first priority. Because there isn’t any opportunity of underestimating the power of ocean or waves or wind. So, to overcome all the crucial circumstance on the ocean an incredibly stable kayak is your best fellow. Because it gives the ability to run the kayak in waves or naturally rough waters as the stability prevents the water to play with it aggressively. So when you are finding for a true tandem kayak for excursion, then we shouldn’t make the mistake to introduce it. This is a 12 foot longer tandem kayak on where the manufacturer hardly focused to set up the stability. It’s a water excursion kayak what incredibly holds 500 lbs capacity. Whether it’s you and your friend or your wife, both of you would peddle it with speed because of great tracking ability. The seats are also stable and the backrests are efficiently extended to accommodate the back up to the neck. A wide deck with the ample space might encourage anyone to stay a long time on kayaking. Because in a large ocean, the narrow space on the vessel can be the meaning of insufficient stability. In truth, the larger the vessel is, the wider and longer the hull is. So this Perception Pescador had all that consciousness when it was under manufacturing. It’s incredibly large and on the measurement the hull is 13 feet long what offers an ample space on the deck. So either you enjoy the deck space or carry something, you have the both options to choose. Its extraordinary size and stability never would frustrate your friend and you in the time paddling on the wavy water. The seating systems are huge different than other kayaks as they directly built up the seating place over the deck. The seating position is molded with the hull and the manufacturer claims it as Comfort Seating System. The backrests are also compact and ergonomic than many ones. To enjoy a weekend with the family and tour in the swamp forest, lake and river, you need a compact and elegant kayak what doesn’t give you the trouble of transporting, because it smartly stores on the truck and SUV. This Lifetime 10 Foot Manta intelligently maintains the rule of what a family guy wants. The tricky size isn’t going to be crucial to be stable in the water. Because the wideness is simply bigger than the average what wouldn’t act like to be imbalanced when you stand up on the deck for having a better view and seat horizontally to just have fun in the water. As well, the kayak has open three molded seats that are built up over a tunnel shape. They built up three seats over the tunnel with two backrests, but the large tunnel can hold your two small kids and your wife. If your whole family doesn’t weigh more than 200 kg, then its 226 kg weight capacity would perfectly hold them over the water. For adventurous kayaking in the ocean, you need a large, wide and double hull based kayak. The sit-on-top kayaks are double hulled and wide and it tights the air inside the hull to be unsinkable and superbly stable when the wave hits on the kayak’s hull. 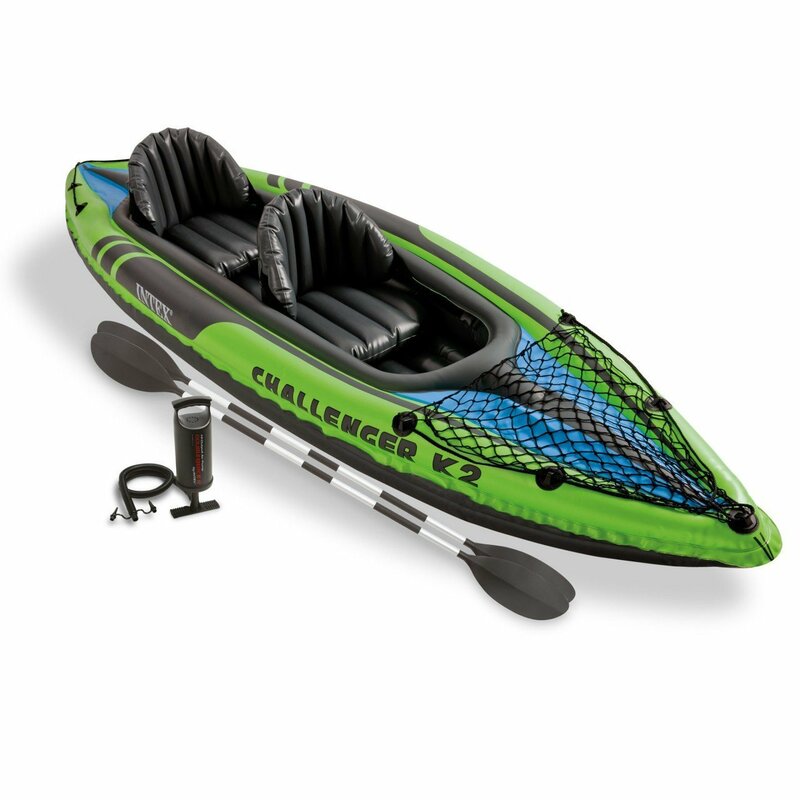 Even if a monster wave leaves gallons of water on the deck and you load the kayak up to the high end capacity, the kayak won’t move under the water. Although the tube of an inflatable kayak is unsinkable because of the internal air, but their best usage up to the calm or medium wavy water where the monster wave wouldn’t hit on the deck. Literally many of us like recreational inflatable kayaks as they are compact and portable. Actually, this Advanced Elements Island Voyage 2 won the place of our best choices. Because we liked the design, capacity and its sturdiness. The PVC tarpaulin hull is remarkable that can’t be punctured unless the hook or sharp anything brutally hits the hull. A strong polyester fabric also smartly covers the hull as the big prevention of damaging. The stability is almost similar to a strong hull kayak and the seats would keep up giving the comfort until you are in the kayak. A tandem kayak can maximize the level of having fun in the water and when you are planning to enjoy such amazing fun with friends or family, these five best tandem kayaks would be the great option for you. So pick one from these five and enjoy the great weekend in summer.